December 1994 in Mesquite, Nevada. Photos taken the same day in succession. Again, I did not see it with my physical eyes, I only saw the jet trail. Appearing in this one is some interesting images and energy. 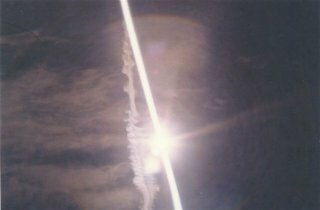 The pillar of light appeared twice in one day. My ability to hear Clairaudiently is the key to capturing these glorious images on film. 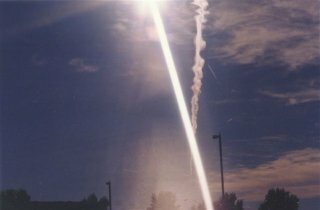 As I looked up to see the jet trails (I believed were not really from jets), I would hear in my ear, "take the picture" and later upon development the Pillar of Light would appear. You can see an Angel" image in this one.